Are you looking for B&B Plymouth? If so, Jewells Guest House bed and breakfast Plymouth Hoe is the perfect place for you. As a local, family-run bed and breakfast we take pride in offering a friendly and comfortable living environment for all our guests during their stay with us. We understand that finding the right place to stay can be difficult. For this reason, we take pride in offering our customers exceptional accommodation right in the heart of Britain’s Ocean City. 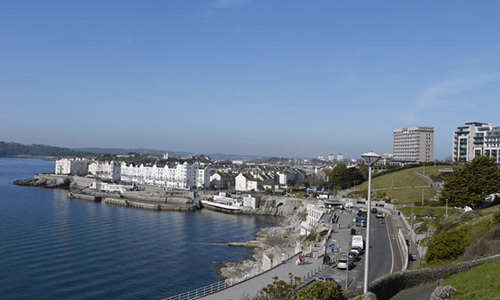 Whether you’re looking to visit the picturesque sights of Plymouth Hoe and The Barbican or fancy a trip to the shops, all the local attractions are just a few minutes away. So, if you’re looking for the best B&B in Plymouth why not give us a call? Our spacious and comfortable rooms offer free access to super-fast WiFi, state of the art flat-screen TV’s and tea and coffee facilities. We look forward to welcoming you to our Plymouth B&B soon. Our recently refurbished guest house Plymouth is perfect for any guests visiting the local area on business, vacation or for those visiting family. Our hotel rooms are fully equipped with all the necessary facilities you will need during your stay with us. Guests can enjoy cheap accommodation in Plymouth while benefitting from nearby attractions and picturesque views within walking distance. Our guests can also gain access to fast and free Wi-Fi, tea and coffee stations and a flat-screen TV. Furthermore, if you require any additional items in your room, let a member of our staff know and we will do our best to assist you. Finding a B&B in Plymouth with parking can be a difficult task. However, at Jewells Guest House our guests are provided with cheap on-street parking just a few steps from the guest house entrance. For a comfortable, welcoming room and delicious, wholesome breakfast, make Jewells Guest House your number one stop. 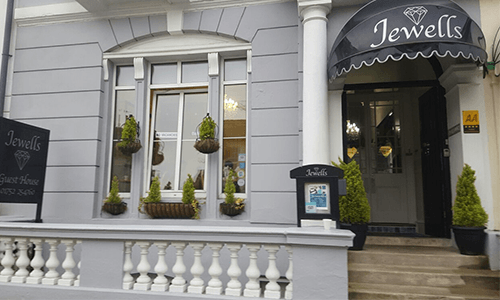 Situated in Plymouth’s idyllic city centre, Jewells Guest Accommodation offers rooms with flat-screen TV and free WiFi access 200 yards from the Hoe Park and 450 yards from the Royal Citadel. Breakfast is served every morning in the dining room with a fireplace. An array of restaurants serving regional cuisine and fish specialities surround the property, supermarkets are available nearby. The Dartmoor National Park, where guests can enjoy an array of outdoor activities including hiking, is 11.2 miles away. Penzance is 49.7 miles from the accommodation and Newquay is 31.1 miles away. Looking for the best place to eat breakfast in Plymouth? Guests staying at the Jewells Guest House will be spoilt for choice on breakfast destinations. 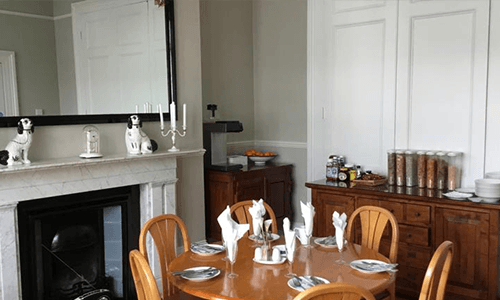 Located conveniently in the heart of Plymouth, guests can choose to enjoy a delicious full English breakfast in our guest house or venture out to many nearby cafes and bistros. A delicious full English breakfast will be provided for all of our guests every morning from 7:00 am – 9:00 am Monday to Thursday and 8:30 am – 9:30 am Friday to Sunday. Our cosy dining room boasts a stunning open fireplace and a spacious eating area for our guests to enjoy. In order to cater to each of our guests, we can provide multiple breakfast accompaniments and Vegetarian options when requested. If you have any queries regarding our bed and breakfast services, do not hesitate to contact us. So, if you require further information regarding our B&B Plymouth, do not hesitate to get in touch with us on 01752 254760. A member of our professional and friendly team will be happy to offer advice on any questions or queries you may have regarding your stay. We look forward to hearing from you very soon!